Rakusan did not include the Fan Series in his main sequence numbering. Therefore, the original number used for each of the 36 Series prints has been modified to identify the Fan Series members of its theme. The five different fan silhouette shapes have been here assigned arbitrary numbers 1 through 5. To indicate a fan design these shape designations are added to the 36 Series number separated by a hyphen. 113-3 is the Fan Series design with fan shape 3 in the 113 Cockscomb theme. Like all other designs in this series, 113-3 was only produced in a single print run, and few copies are currently documented. The 113 Cockscomb theme is one of the many entirely regular themes represented by a complete fan quintet and a color woodblock print. The Fan Series prints of the 113 Cockscomb theme were distributed in mid 1934 in installment five (of twelve). The delivery documents for installment five remain to be discovered, but its delivery month was either July or August 1934. The woodblock prints would have been printed earlier in the same month as their distribution. The contents of installment five had been previewed in the delivery documents for installment four. However, a different theme had been announced as 113, and the cockscomb designs were apparently a last minute substitution for this position. The individual designs in the 113 Cockscomb theme were completed in at least two stages. Four of the five fan designs have seal C which indicates a carving date during the first half of 1934. The remaining fan design 113-3 and the 36 Series design 113 have seal B which indicates a later carving period closer to the time of publication. The name used here for the 113 Cockscomb theme is a translation of 鶏頭, keitou, upon which the Japanese names for not only all varieties of cockscombs, but also for amaranths and other members of the Amaranth Family, are based. The six designs of the 113 Cockscomb theme include four only with crested cockscombs, one with both plumed and crested cockscomb, and one with tricolor amaranth. Therefore, the theme is based not only to the crested cockscomb design 35 of the earlier 100 Series, but also to the tricolor amaranth design 55. 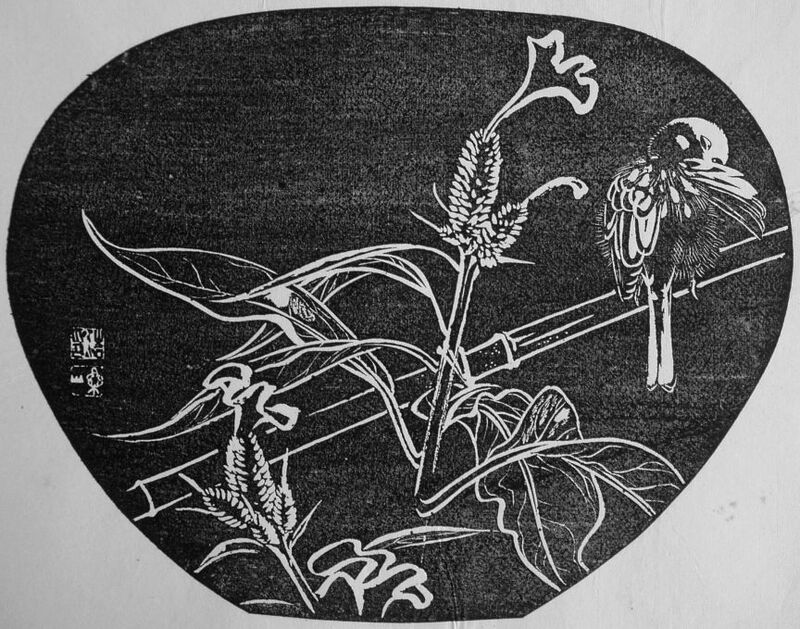 At least some 113 Cockscomb theme designs were adapted from sketches originally created in the late 1920s for those earlier large designs (see below). The composition of 113-3 includes two small flowering heads of crested cockscomb, the taller of which is tied to a bamboo pole or trellis for support. Sitting on the pole at top right is a sparrow preening itself. 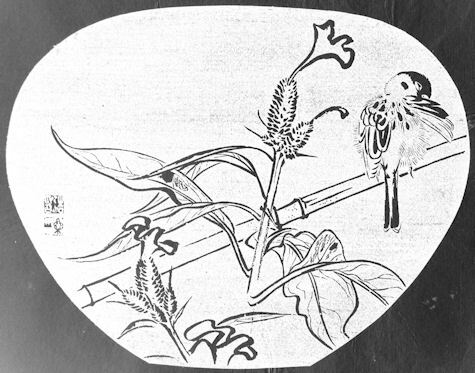 The cockscomb plants and the bamboo pole are rendered as rather fluid, but still detailed, bold line drawings which work well viewed as ishizuri or as the reversed original. However, the sparrow is very finely detailed with the areas of light and dark correct only in the original drawing. Although not native to Japan, cockscombs and the related amaranths are old garden imports which for centuries have been extensively bred and hybridized by Japanese horticulturalists. These plants were favorite subjects for Rakusan and several diffferent kinds appear in his prints and paintings. The general name for the group is also the species name of the crested variety of cockscomb (sometimes simply called cockscomb), Crested Cockscomb, Celosia (argentea var.) cristata, 鶏頭, けいとう, ケイトウ, kei-tou, lit. 'chicken-head'. Crested Cockscomb is the variety Rakusan illustrates in 113-3, and also in all of the other designs in this theme except 113-1. Eurasian Tree Sparrow, Passer montanus, is today written in Japanese ornithological texts as スズメ, suzume, where it refers only to this species. However, popular usage, 雀, suzume, remains a very common general name for any sort of small sparrow or sparrow-like bird in modern Japanese.